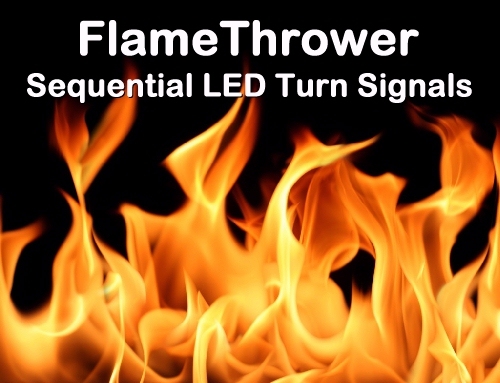 Brand New, Perfect FlameThrower LED Sequential Turn Signal System for a 1964-66 or 1967-68 Mustang Coupe, Convertible or Fastback with factory standard brake and turn signal lighting and wiring, with FREE True LED Electronic Flasher (Mustang 2-Terminal). What you get is One Pair (one left side and one right side) of Red Rear Lenses, packed with SuperBright LED-filled circuit boards - the absolute latest technology for your Vintage Mustang. Wired in each assembly is our Sequential Turn Signal Controller. FlameThrower System comes with a super Installation Guide, Wiring Diagrams and Mustang Brake Light System Troubleshooting Guide. The FlameThrower is dirt simple to install. Saves you money by providing you a New set of Red Lenses to replace your broken or cracked ones. Installation is a snap: Remove your Red Brake Light Lenses and your 1157 incandescent lamps. Replace them with our Red Brake Light Assemblies, plug the connector into the 1157 lamp socket & reinstall Lenses. Done. This is a screwdriver operation, No Wire Cutting, No Splicing into your system, Simply Plug and Play. FlameThrower system LEDs provide 3-6 times the brightness over incandescent lamps, and they last for years. Imagine not having to replace the incandescent bulbs every time they get wet! Instantly reversible back to your original incandescent system, if you want to move your Sequential Brake Light system to another vehicle. Review the Sequencing in the animation above. This is what your new FlameThrower Sequential Brake Light (SBL) will give you. 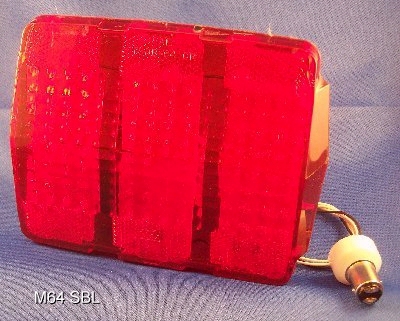 NOTE: While sequential brake light systems are compliant in all 50 states (thanks to Thunderbird, Cougar, the new Mustang, and other production vehicles), the SBL is not type-approved for each state. Check with your local transportation authorities before you buy. Don't spoil your driving fun with an equipment violation, if sequential brake lights are not approved in your locale! A couple of states require that a vehicle's brake light comes on and stays on as long as the brake pedal is pressed. Our system is compatible - a minimum of one brake light comes on and stays on (on each side) until the brake pedal is released. The remaining two segments on each side sequence once and then remain on. Should for any reason the Sequencer fail, our system is designed to light at least one brake light and all of the parking lights on each side - enough to get you home safely. Some incandescent Flashers will not work with LED lighting devices. 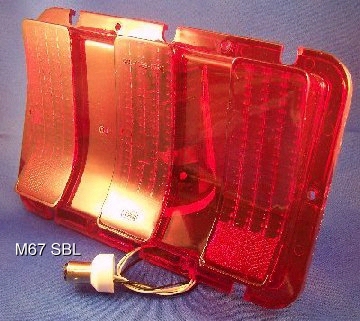 We INCLUDE FREE a True LED Electronic Flasher (Mustang 2-Terminal) with your SBL system. Your OEM 2-terminal flasher is usually located behind the instrument cluster on your dashboard. Generally, if you have ANY incandescent lamps in your directional wiring (i.e. front and/or hood incandescent lamps) your existing flasher will probably work fine for these LEDs assemblies. Our True Electronic Flasher will work on LED systems, Incandescent systems, or a mix of both. These FULLY TESTED units are being offered WITH A FULL 90-DAY PARTS REPAIR OR REPLACEMENT WARRANTY (our choice) ON THE SEQUENCERS, LED MODULES AND THE TRUE ELECTRONIC FLASHER. Customer is responsible for removal, installation and warranty shipping costs. ORDER THE FLAMETHROWER SBL NOW!